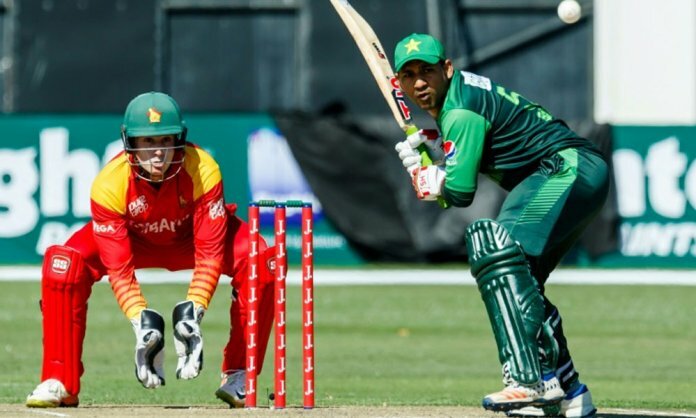 Opener Fakhar Zaman top-scored for Pakistan with 47 before captain Sarfraz Ahmed overcame a spirited Zimbabwean fightback and saw his side home with an unbeaten 38. Their efforts meant that Zimbabwean allrounder Solomon Mire’s bellicose earlier innings earlier went in vain. Mire struck 94, the highest score by a Zimbabwean in Twenty20 internationals, but Zimbabwe’s 162 for 4 was not enough to overcome the world’s top-ranked T20 side. Zaman said Pakistan was always confident they could pull off a successful chase. Pakistan has given a rapid start by Zaman and fellow opener Haris Sohail, who took 56 from the Powerplay. Sohail holed out soon afterward, but Zaman continued to show the sort of touch that made him vital to Pakistan’s successful Champions Trophy run last year. Mixing aggression with an ability to maneuver the ball around the field, he cracked four fours and a six. The tactic spoke volumes about his development as a limited-overs batsman. “In the start in T20 I was hitting every ball in my striking zone, but after playing eight to 10 games I sat with some senior players like Shoaib Malik and Sarfraz Ahmed, and spoke about my gameplans with them,” Zaman explained. He may have learned even more from Ahmed’s innings of calm precision that kept Pakistan up with an asking rate that hovered around eight for much of the match. Executing his attacking strokes perfectly, Ahmed found the gaps and the boundaries whenever they were needed. Where Ahmed’s innings was one of finesse, Mire’s 63-ball 94 for Zimbabwe showcased big-hitting ability. Mire started slowly, but hit his first six into the stands beyond long leg to move into the 20s and was soon smashing Pakistan’s attack to all corners of the ground. He collected a fifth six with a huge strike down the ground off Mohammad Nawaz’ left-arm spin, and then lifted fast bowler Mohammad Amir for the biggest hit of the day, over the roof of the three stories stand beyond midwicket. “We were expecting 130 to 140 on this pitch, but Mire played a very good inning,” said Zaman. It was not enough to beat Pakistan, however, who have now assured a place in Sunday’s final against Australia.